Hello and happy Tuesday, friends! 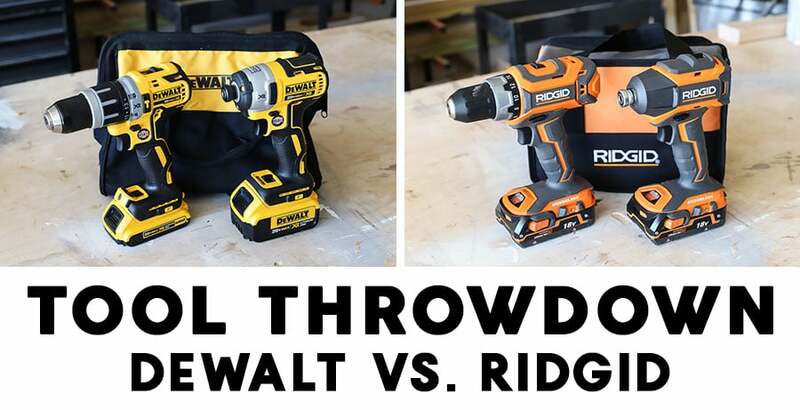 Today we’re taking a close look at the new brushless drill/driver and impact driver kits from DeWalt and Ridgid! 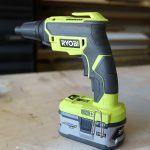 Brushless technology at entry level price point. 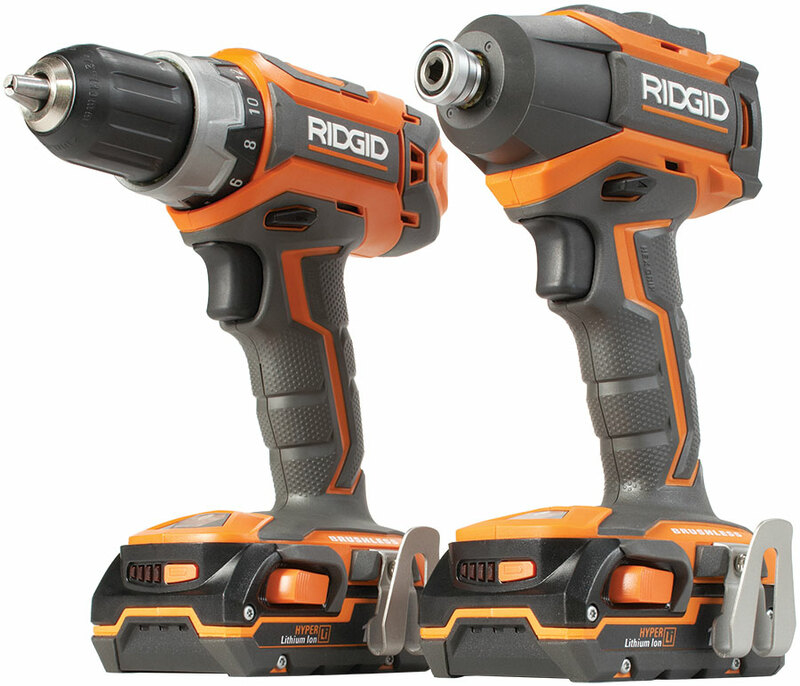 I have to give the win to Ridgid on a couple accounts. First, the price. The two brands are so close in specs – the $70 price difference seems like a huge gap. 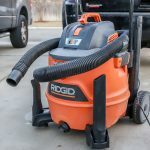 Second – and this is a big one – Ridgid’s lifetime warranty! You just can’t beat it. 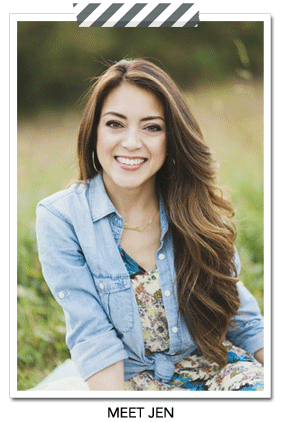 Free batteries and service for LIFE?! That’s just insane (in a good way). 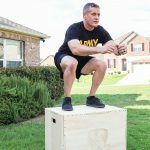 It’s quite an impressive way for them to show consumers that they stand behind their products 100%. We used all four of the drills on our neighbor’s triple bunk bed build and were able to truly compare the two brands side-by-side. 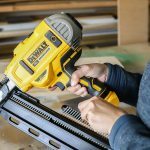 While the DeWalt specs tout more power and speed, we didn’t experience a considerable difference in performance. 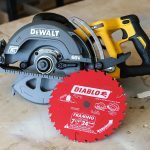 The DeWalt felt a little smoother and was a little quieter to operate than the Ridgid, but the difference was minimal. Both drills felt very comfortable in our hands and were easy to operate. I especially appreciate the lightweight and compact size for my small hands, while Adam was indifferent here. But he has big man hands, so his opinion on this count is moot. 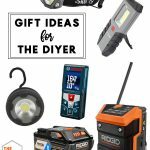 DeWalt wins this one. 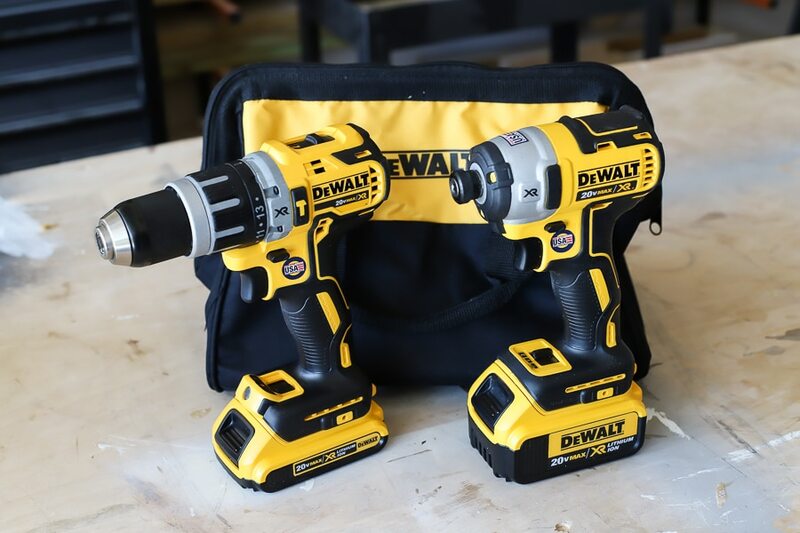 Both have LED lights, but as you can see from the photos, DeWalt’s lights are much brighter and better positioned on both the impact driver and drill/driver. Ridgid’s lights are located at the base of the drill, which makes for a dimmer-lit work area. While the light is located at the base of the DeWalt drill/driver (like Ridgid’s), it’s tilted up, lighting the work area substantially. 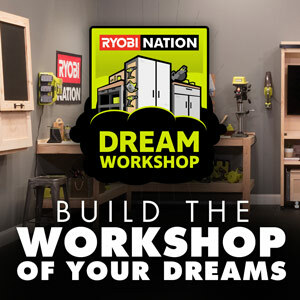 Ridgid wins this one. 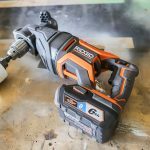 Handling the battery on the Ridgid drill is easier and feels more natural than the DeWalt. The DeWalt’s button is larger and is located on the top front of the battery, which feels a bit more awkward to press when removing the battery. 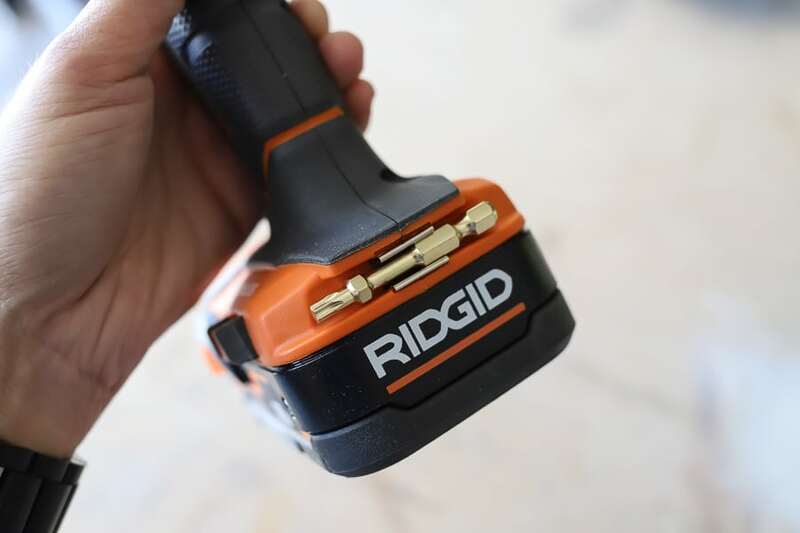 There are two buttons on each side of the Ridgid battery, which allows for a more natural hand position. Notice Adam’s strange claw hand on the DeWalt. Also, when pressing the Ridgid’s button, it actually ejects the battery out, making removal more effortless. Ridgid wins this one based primarily on personal preference. It’s a toss-up otherwise. Adam says the thought of tightening the DeWalt drill’s chuck with his bare hands gives him the heebie jeebies (that’s a technical term). Something about that metal ratcheting chuck makes his hair stand on end. I guess it’s the same as how some folks can’t stand the sound of nails on a chalkboard. The chuck on the DeWalt doesn’t bother me, but I usually defer to Adam when tightening the chuck anyway, because he has the grip of a pro golfer. I do like that the DeWalt’s chuck is metal, whereas Ridgid’s is plastic. *Note to Adam: wear gloves when tightening the chuck on the DeWalt drill. 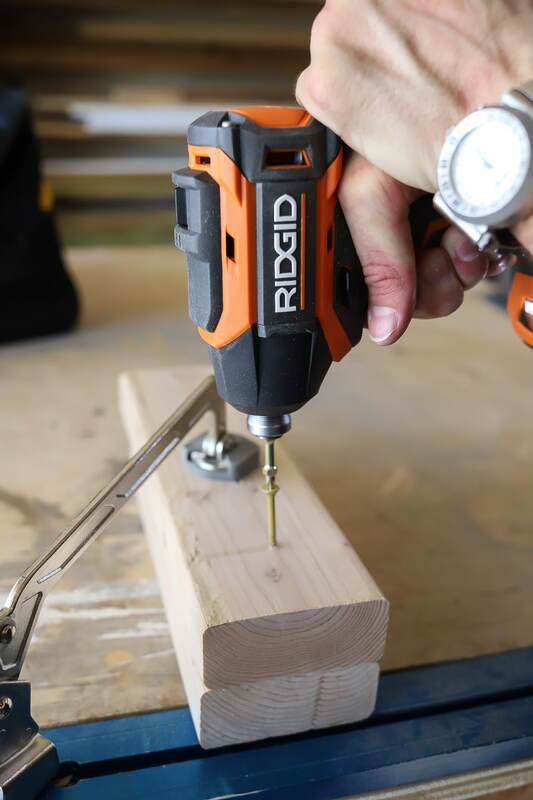 Ridgid has this nifty little drill bit holder – a small, but nice-to-have feature. I don’t understand why all tool brands don’t include this clever feature on all of their drills. Seems like a no-brainer to me. Win for Ridgid. 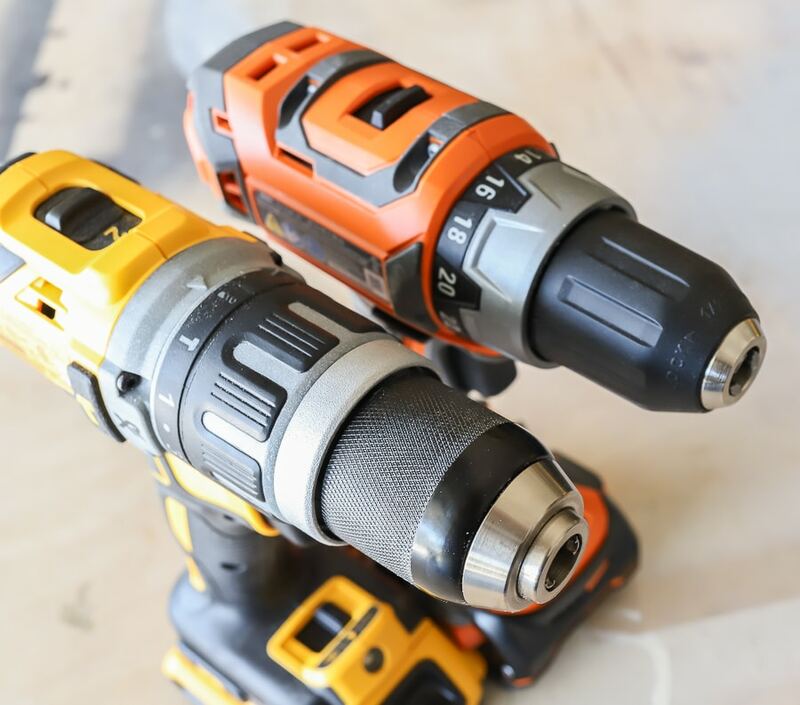 While the DeWalt and Ridgid Brushless Drill/Driver and Impact Driver Combo Kits are extremely comparable – their specs are nearly identical in power, speed, handling, and performance – there’s a $70 price difference between the two brands. 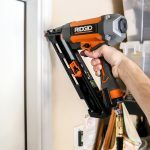 It’s the lifetime warranty and the small, but thoughtful details like the drill bit holder and effortless battery handling that sets Ridgid apart. 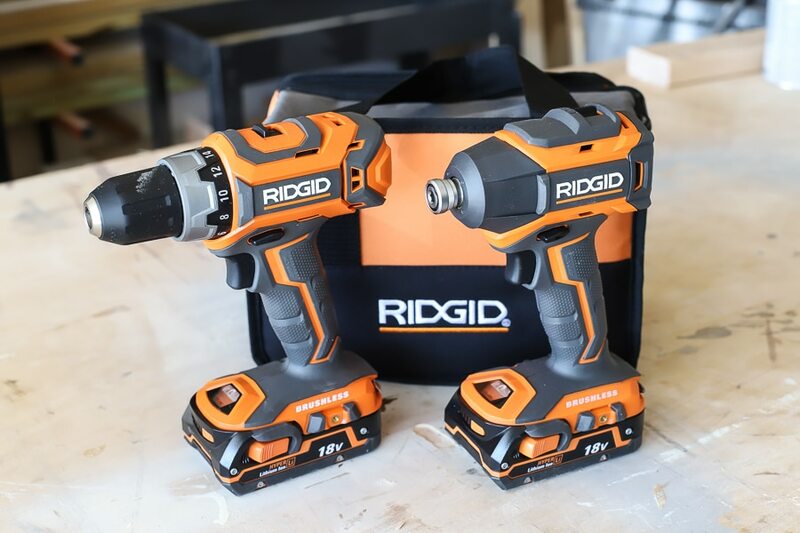 If you’re in the market for a powerful yet affordable brushless drill/impact driver combo kit, Ridgid is your go-to guy.